Asbestos is a toxic and natural mineral. Exposure to asbestos fibers is the leading cause of mesothelioma. While it is globally recognized as a carcinogen, its use in products is banned in only 55 countries but not in the United States. Asbestos is a naturally occurring mineral substance that can be pulled into a fluffy consistency. Asbestos fibers are soft and flexible yet resistant to heat, electricity and chemical corrosion. Pure asbestos is an effective insulator, and it can also be mixed into cloth, paper, cement, plastic and other materials to make them stronger. These qualities once made asbestos very profitable for business, but unfortunately, they also make asbestos highly toxic. Asbestos is not a single type of mineral — rather, it refers to a group of silicate minerals that share the same fibrous nature. In business terms, it was common to speak of common “white asbestos” (chrysotile) and the less often used “blue asbestos” (crocidolite) and “brown asbestos” (amosite). Legally, the U.S. government recognizes six types of asbestos that fall into two general categories as outlined in the Asbestos Hazard Emergency Response Act (AHERA) of 1986. Scientifically speaking, other asbestiform minerals exist that may be just as dangerous as the six legally recognized types. In 2008, legislation was introduced in Congress that would have extended the definition of asbestos to include other amphibole minerals such as winchite and richterite. However, in the decades since AHERA was passed, every further attempt to regulate asbestos in the United States has failed due to pressure from business interests. Though the use of asbestos is heavily restricted, the United States remains one of the only developed nations in the world that has not banned asbestos. Currently, it is legal to include asbestos in almost all types of American products as long as the product does not contain more than 1 percent asbestos. In 2018, American companies imported 750 metric tons of asbestos, according to the U.S. Geological Survey. Further, many old buildings and machines in the United States still contain high-percentage asbestos products that were manufactured before modern regulations came into effect. In addition, manufacturers in China and India routinely use asbestos in their factories. Asbestos remains a threat to the health of people in the United States and all around the globe. Microscopic asbestos fibers cannot be seen, smelled or tasted, and asbestos exposure does not cause any immediate symptoms, so it is easy for a person to inhale or swallow asbestos dust without realizing it. Once asbestos fibers are in the body, they never dissolve, and the body has extreme difficulty expelling them. Over years of time, trapped asbestos fibers can cause inflammation, scarring and eventually genetic damage to the body’s cells. Asbestos-related illnesses often take 20-50 years to develop, which means most cases diagnosed in the United States today were caused by asbestos exposures that occurred before modern safety regulations came into effect. Occupational exposure is the primary cause of asbestos-related illnesses, followed by secondhand asbestos exposure. Asbestos-related illnesses can also develop in people who lived in a contaminated environment or used asbestos-containing consumer products on a regular basis. No amount of asbestos exposure is safe, but asbestos generally has the worst effects when a person is exposed to an intense concentration of it, or they are exposed on a regular basis over a long period of time. More asbestos accumulates in the body with every exposure, and there is no known way to reverse the cellular damage it causes. Asbestos fibers most often accumulate in lung tissue and in the membrane lining the lungs called the pleura. Benign asbestos-related diseases include asbestosis, pleuritis and chronic obstructive pulmonary disease (COPD), which make it difficult for patients to breathe. Asbestos also causes malignant diseases such as lung cancer, pleural mesothelioma and peritoneal mesothelioma, and it is the No. 1 cause of occupational cancer in the world. For much of the 20th century, the words “asbestos” and “insulation” were used almost interchangeably in the United States. The first modern asbestos companies were formed in the late 1800s to service the steam engines and locomotives of the Industrial Revolution. The asbestos insulation industry grew in scope and profitability with the introduction of oil refineries and heavy manufacturing facilities. Asbestos insulation was available for every wall and pipe, from family homes to power plants. 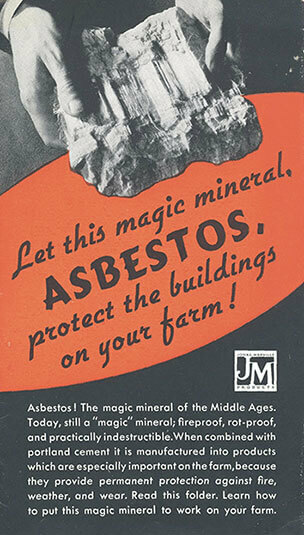 Asbestos was cheap and easy to source from North American mines, so company executives promoted as many uses for it as they could find. Asbestos became a ubiquitous ingredient in a new generation of fire-resistant construction materials including cement sheets, roof sealants and adhesives for floor and ceiling tiles. World War II created a massive demand for asbestos on U.S. naval ships and military bases. After the war, the asbestos industry produced asbestos insulation for suburban homes and appliances as well as gaskets and brake pads for automobiles. As skyscrapers came to dominate city skylines, their girders were sprayed with asbestos fireproofing. Other consumer products were manufactured with asbestos-contaminated vermiculite or talc, exposing yet more Americans to the toxic mineral. The list of asbestos products goes on, ending only when the dangers of asbestos exposure were finally revealed to the American public in the 1970s and 1980s. American asbestos mines operated for more than 100 years before the last mine closed in 2002. Consumption of asbestos in the U.S. peaked in the mid-1970s at more than 800,000 metric tons — though global production of asbestos continues at 2 million tons per year, driven by demand in developing nations where asbestos insulation and cement are still commonly used. 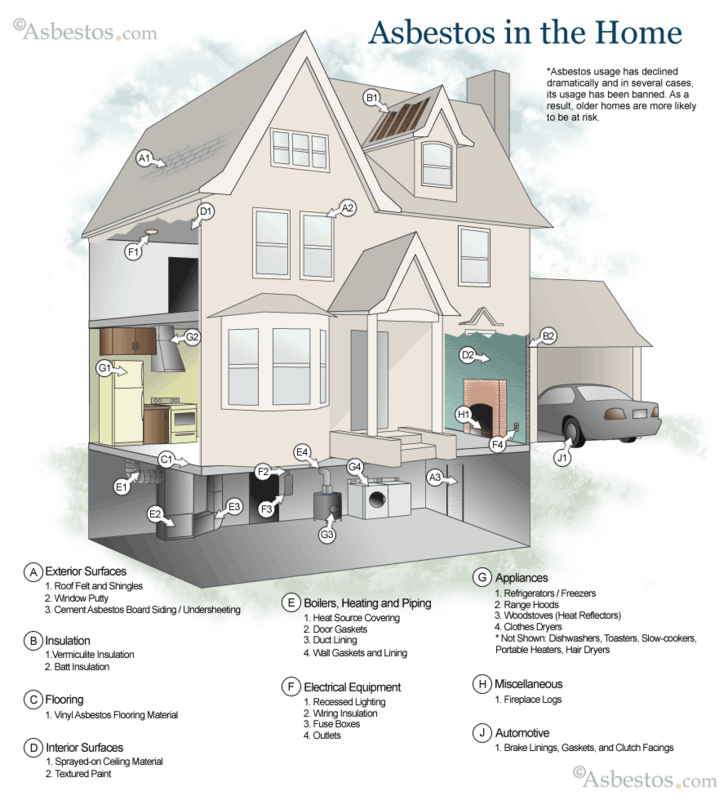 Many American buildings constructed before 1980 contain asbestos, and asbestos-containing materials come in many forms. Unless a product is clearly marked, you cannot determine whether it contains asbestos just by looking at it. Sometimes it is vital to remove an asbestos-containing material, and sometimes it is safest to leave the material undisturbed. The evaluation and removal of asbestos should be left to certified asbestos abatement professionals. The vast majority of patients with asbestos-related diseases are men in their 60s or older. This is because asbestos-related diseases have a very long latency period, often taking decades to develop, and they usually trace back to occupational exposure at workplaces historically staffed by men. Family members of asbestos industry workers also bear an elevated risk of developing an asbestos-related disease due to secondhand exposure. Workers often unknowingly brought asbestos dust home with them on contaminated clothing and tools. Finally, living in the vicinity of an asbestos-contaminated mine or processing facility puts individuals at risk of environmental exposure. Asbestos industry work sites have existed all across the United States. For example, one of the worst environmental disasters in American history was caused by decades of vermiculite mining near the town of Libby, Montana. The vermiculite extracted from the mines contained traces of asbestos that contaminated the surrounding area for miles, eventually causing the deaths of hundreds of Libby’s residents. The U.S. military used asbestos extensively from 1935 to 1975, especially on Navy ships, causing military veterans to bear a disproportionate burden of asbestos-related disease. Veterans make up less than 7 percent of the U.S. population, but they account for more than 30 percent of all mesothelioma cases. Ancient Egyptians wrapped their embalmed pharaohs in everlasting asbestos cloth, and the bodies of medieval kings and generals were cremated within asbestos shrouds. Ancient Roman aristocrats dined with asbestos tablecloths and napkins, which they could simply throw into a fire to clean. Roman historian Pliny the Elder documented the lung disease suffered by the slaves who mined and wove asbestos fibers, and his writings even describe the slaves’ primitive attempts at inventing respirators. The early history of asbestos foreshadows its rise and fall in the 20th century. Business leaders enthusiastically advertised every new use for the highly profitable mineral they could find, but they kept the terrible toll of asbestos exposure on their workers a carefully guarded secret. Instead of protecting workers, asbestos industry leaders chose to suppress or manipulate medical research findings as long as they could. The great asbestos cover-up has led to thousands of entirely preventable American deaths. Asbestos industry leaders stymied safety regulations, because they did not want to draw any attention to the risks of asbestos exposure. The medical evidence kept piling up, however, so it was only a matter of time before the misdeeds of the asbestos industry caught up to them. The first successful asbestos lawsuit was won in 1973. Since then, hundreds of thousands of claimants have sought compensation for personal injuries and wrongful deaths caused by the negligence of the asbestos industry. More than 100 companies have filed for bankruptcy because of asbestos lawsuits, and asbestos litigation continues to be the longest running mass tort in U.S. history. Since the 1980s, manufacturers in the United States have largely phased out the use of asbestos, relying instead on several safer substitutes. Polyurethane foam is multifunctional, affordably priced and effective for insulation. Construction workers can quickly and easily apply spray polyurethane foam to insulate and seal buildings, and manufacturers frequently use flexible polyurethane foam in consumer products such as furniture, bedding, carpet cushion, packaging and automotive parts. Amorphous silica fabric is a high-quality cloth woven from nearly pure amorphous silica fibers. Like asbestos, the fibers do not rot, attract mildew or burn, and they are highly heat resistant. This fabric is primarily used in the shipbuilding, automotive, electrical, aerospace and metallurgy industries. Thermoset plastic flour is made of a mixture of wood fibers and binders such as egg or gelatin, which is hardened and then finely ground. As a filler for moldable plastics and adhesives, it provides similar benefits as asbestos without putting workers at risk, making it popular in construction. Cellulose fiber is typically made from cotton, wood pulp, linen or shredded paper that is chemically treated to enhance it properties. Cellulose fiber cement is one of the most common asbestos-cement substitutes for wall and ceiling coverings, high-temperature insulation and roofing. Keyes, Dale. (1985). Guidance for Controlling Asbestos-Containing Materials in Buildings. Collingdale, PA: Diane Publishing Co.